Current DeKalb Fire Chief Eric Hicks congratulates former DeKalb Fire Chief Albert "Rip" Riippi after his speech during the ladder truck dedication ceremony in Rip's honor at the DeKalb Fire Station #1 in DeKalb on Friday, June 3, 2016. 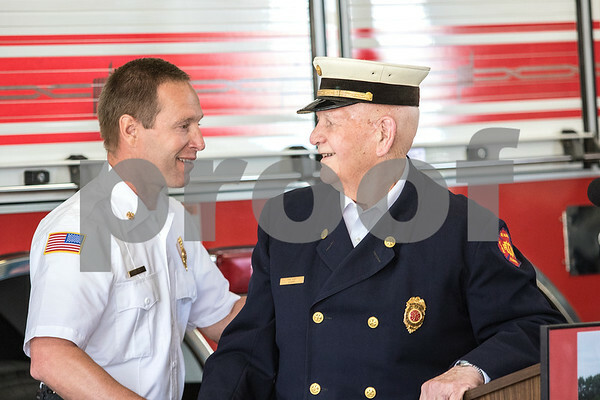 Rip was with the DeKalb Fire Department from 1947 and retired as Chief in 1986. The ladder has a "Rip" Roaring decal and a 59 logo for his badge number.